You’re going to want hooks, stools and a rail for guests to put their feet on. A mirror on the back wall is always a nice touch. And if you want to go really crazy, call the plumber and install a sink. 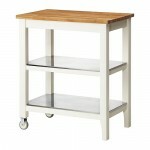 But if you’re like us and live in a small apartment, an kitchen cart from Ikea works just fine. That said, no bar is really functional without ice. Ideally you can have a dedicate refrigerator for ice and glasses—if not a built-in ice maker. Barring that, just get a set of silicone ice trays (small cubes for shaking, large cubes for cocktails) and keep a sealed container full of ice in your freezer. For a larger events you’ll want to stock up. Professor Santer recommended 5-10 lbs of ice per-person. There’s no way you’ll need this much unless you constantly mix cocktails for everyone in the room all night (i.e. I really want to go to one of his parties). In my experience, more like 2-3 lbs of ice per-person is perfectly sufficient. But be sure to have beer and wine as well to give people options and yourself an occasional break from mixing. Next you going to need the various tools of the trade. Check back next week for a breakdown of bar implements and finally understand the difference between Hawthorne and Julep strainers. 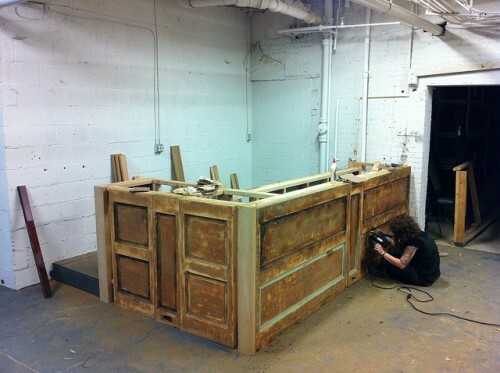 Bar construction photo courtesy of willwhitedc, flickr.